I am a writer, because I blog and have a book published and am always writing things down. Consequently, when I tell people I am going to college, they often wonder if I am an English major. I am not an English major. 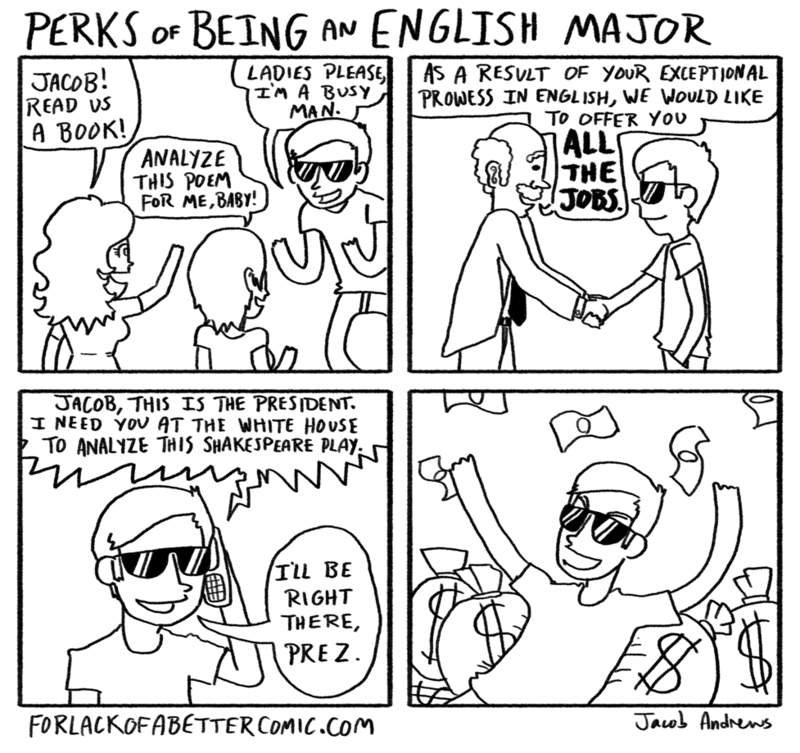 The prospect of being an English major fills me with cold dread. Somehow, I’ve always been convinced that English majors have to analyze a bunch of stuff, finding deep meanings in things that have only simple straightforward meanings. People trying to find a deep meaning when there is a simple meaning is one of my life pet peeves. One day, I was discussing The Great Gatsby with my mother. She read it in literature class in high school, whereas I read it for the fun of it. So I went on about how the writer used these long lazy languid words when he was describing a really hot day, and how interesting of a character Tom Buchanan was, etc. Therefore, I signed up this term for a literature class. Now, there have been some wonderful things happening in this class. Like, reading the literature. Hearing the presentations people give in class. Watching author interviews on youtube. Etc. I am either not an analyzer or not the right kind of analyzer. I’d rather read and love the story than try to dig out an obscure theme. Also, I get very tired of the way that everyone views the literature they read through their 21’st century rose-colored glasses. I mean, of course Americans oppressed blacks, were terribly cruel to the Native Americans, and many men mistreated women. But we all already know this. How is it considered literary analysis to sit around and steam about this for half an hour? Well, the bottom line is that I am glad I only have to take one literature class. And I am glad that I am not an English major. And I am glad that in the field of Communications, getting straight to the point is valued highly. I get so tired of people trying to drag out long and complicated analyses of writings when maybe the author never even meant it that way! I would rather just talk about the book than try to analyze everything to bits. I’m taking a children’s literature class right now, which is fun because we get to read lots of kids’ books, but I also wrote a 6 page paper last week on a picture book! I don’t think it’s possible to squeeze any more analysis out of that book. Ha ha don’t even get me started on poetry! Sometimes I just want to laugh at the “meanings” people can extrapolate from poetry to make themselves feel deep. I’m currently in the process of trying to choose a major for college. I think it’s interesting that you’re a Communications major, because I’m strongly considering majoring in English-Communications or Business-Communications. I’m curious. What careers do envision you and your colleagues will have after college? Do you feel that there will be an abundance or lack of jobs for Communications graduates in the next ten years? Okay, rant finished for now. Have a good weekend!